Home » Lesbian Startalk – Happy New Year! January is the month of Capricorn, with it’s opposite Cancer. And this month, and year, begins with a revelatory super Full Moon in Cancer, the peak of the lunar cycle. Happy New Year to all. I hope your holidays were safe and happy, no matter how you celebrate. My wish for 2018 is that it will be less chaotic, and have less disasters than 2017. This Full Moon represents a choice. Do we stay stuck in the past, or break free of the patterns that no longer serve our growth, and open expansion in ourselves and life. The Full Moon in its home sign of watery Cancer represents the Great Mother goddess, empowering the start of the New Year with fertile, creative energy. Further activating the flow, the Moon forms a grand water trine with Neptune in Pisces and Mars in Scorpio. Our psychic sensors are wide open, allowing access to our deeper knowing. Opposing the Cancer Moon are the Sun and Venus, in earthy Capricorn, the pragmatic sign of long-term goals, worldly success, and social responsibility. The job of Saturn ruled Capricorn is to focus the ever-shifting structure of the Cancerian flow, and bring it into form. But when our inner guidance seems to defy logic or practicality, or seems to disrupt the plans for how we think our lives should go, fear and insecurity can arise. Powerful insights are available at this Full Moon. But if we let fear take the reins, we’re in danger of defaulting to the shadow expression of the Cancer-Capricorn polarity. The Cancer part of us pulls back into its crab shell, clinging to the safety and comfort of the known and familiar. The Capricorn part attempts to control, restrict, or shut down the flow. This Full Moon asks us to soften our defenses, open our hearts, and feel it all. Balance is the key. 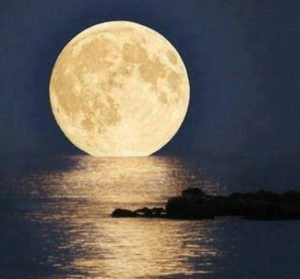 With Saturn now in Capricorn, and approaching the great meeting of Saturn, and Pluto in January 2020, this Full Moon reminds us of the importance of leaning into the water element to balance the emphasis on earth. Cancer’s acceptance of all emotional states balances Capricorn’s tendencies toward judgment and the accomplishment at the expense of needs and feelings. Amping-up the Full Moon’s capacity for breakthrough and transformation, Uranus stations direct on January 2nd. For the past five months, the Uranus retrograde has been a time when major changes have been simmering on the back burner or happening on a more internal level. Now, Uranus’s return to direct motion brings a lightning bolt of awareness about the changes that are ready to happen, catalyzing us out of stagnation and into action. Uranus is back within a 6-degree orb of its square to Pluto, a paradigm-shifting alignment that was strongest in 2012 – 2015. Capricorn is the sign of responsibility, and Pluto in Capricorn says that the more responsibility we take for everything that happens in our lives, the more powerful we become as creators of our reality. There may be some confusion on Friday evening the 5th, so be sure directions and information are clear. As they say in construction, measure twice, cut once. Make sure the other heard what you thought you said, and vice versa. Saturday, the 6th will probably be a very busy day, as the helpful Virgo Moon makes lots of harmonious aspects. And this afternoon, when Mercury in Sagittarius trines Uranus in Aries, bringing new and original insights, we waste no time putting the novel ideas to work, as Mars and Jupiter meet in Scorpio an hour later. We’ll feel very productive, but the next day, Sunday, we may not have much energy left, at least in the morning, as the Moon in Libra squares Saturn. So, sleep in and relax that day. On Wednesday night, the 10th Mercury, planet of communication moves into Capricorn. And for the rest of the month our thinking and words take on a more diplomatic and organized approach. This next weekend may start slow, and possibly serious, as Mercury crosses Saturn in Capricorn late Friday night, the 12th. And a half hour later the Balsamic Moon in Sagittarius squares nebulous Neptune. And like last Friday, there may be confusion, so clarity is a must. The next two days are all about eccentric Uranus. Venus squares Uranus, compelling ‘not the usual’ social activities on Saturday, the 13th. Be flexible, as invitations may be impromptu. The next day, Sunday, the 14th, the Sun squares restless Uranus, compelling a one-day need for freedom and independence. Allow yourself to take some space and privacy. On Monday, January 15th, the first Jupiter-Pluto sextile of 2018 occurs from Scorpio to Capricorn, initiating a cathartic process that will be advanced at the second sextile on April 14th, and the third on September 12. Jupiter represents expansion, and Pluto transformation. Jupiter and Pluto working in harmony can inspire us to more fully embrace our passions and to manifest our vision in new ways. The first New Moon of 2018 on Tuesday evening, the 16th, features six planets in Capricorn, challenging us to take charge and commit to a course of action. Capricorn is a powerful manifester and master builder, and rules both fear and authority. Saturn and Capricorn sometimes get a “bad rap,” and said to be negative. Because organization and safety are two of the primary gifts, their job is seeing what could go wrong and fixing it. Saturn and Capricorn also get criticized as being overly concerned with worldly ambition and material accumulation, but one of the expressions of Capricorn is the Hermit, and Capricorn needs some time in solitude and meditation. “High-vibration Capricorn is worldly power wedded with an awareness of our inherent relatedness, power with compassion. On the 17th, Venus moves into quirky Aquarius. Until February 11, Venus will encourage us to explore new and different activities. And on Friday evening, the 19th the Sun, also moves into Aquarius, which will be the sign focused on next month. The afternoon of Wednesday, the 24th begins the challenging First Quarter Phase through Saturday, the 27th, when the Universe suggests there may be adjustments needed to be made in many of our lives. On Friday, the 26th, Mars, planet of how we use our energy leaves intense Scorpio to move into the fire sign of Sagittarius till March 18th. This could propel us into action, lighten our energy, expand our desires, and bring out our playfulness. As the month began with a Full Moon, the month ends on the 31st with another Supermoon, this one in Leo and a lunar eclipse. The Leo Full Moon presents a powerful opportunity to heal our hearts and expand our capacity for love. Because it’s a total lunar eclipse, our shadows are revealed. We can see more clearly everything in our life that is not yet love, the places where we’ve closed our hearts and restricted the flow of love. The big Leo solar eclipse on August 21st is a useful reference point for this one. How has our capacity for giving and receiving love shifted and evolved in the past six months? What seeds of intention were planted then that are now coming to fruition? Have a good start to 2018. I’ll report back for February’s month of Aquarius. Call 707-579-2610 or follow me on facebook. Yo Kayte Wow that is a ton of information nice work girl!!! !